Set in Montreal, Afterglow is simply a film about people. Two couples are living in crippled marriages. Nick Nolte plays Lucky Mann, Mr Fixit, whose sexual adventures are permitted by his wife (Julie Christie) after a fight that split their marriage apart, seemingly beyond repair. He starts working on a project for young executive-wife (Laura Flynn Boyle), a lonely, frightened woman building a nursery when her husband has no interest in conjugal exercises. Things take off when the corporate husband, a man with all the icy self-control of the truly over-emotional meets Lucky's wife in the bar of the Ritz. Their witty repartee is the highlight of the film, lifting it momentarily into the extraordinary. As the film progresses we learn more about the couples, and the individuals, and about the reasons for the breakup of Lucky's marriage. Along the way we can enjoy the clever choice of setting: the unique style of bilingual Montreal and the science fiction coldness of contemporary high-tech high-expense urban apartments. "Drama", said Hitchcock, "is life with the dull bits cut out." 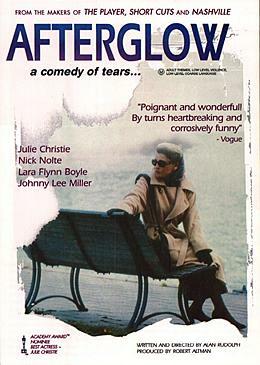 Afterglow has no dull bits, it is carefully timed and staged and the director gives us just the right distance from the characters -- close enough to see, but not so close that we are voyeurs. We see pivotal moments in the lives of four people, and leave them feeling that there are always solutions, but not always the ones that we seek.